Эволюция костюма Капитана Америки / Marvel Cinematic Universe (Кинематографическая вселенная Марвел) :: Captain America (Капитан Америка, Первый мститель, Супер солдат, Кэп, Стив Роджерс) :: Falcon (Marvel) (Сокол, Капитан Америка, Сэм Уилсон) :: Bucky Barnes (Зимний Солдат, Баки Барнс) :: Marvelogy (Марвелогия, информация о вселенной Марвел) :: Marvel (Вселенная Марвел) :: фэндомы / картинки, гифки, прикольные комиксы, интересные статьи по теме. 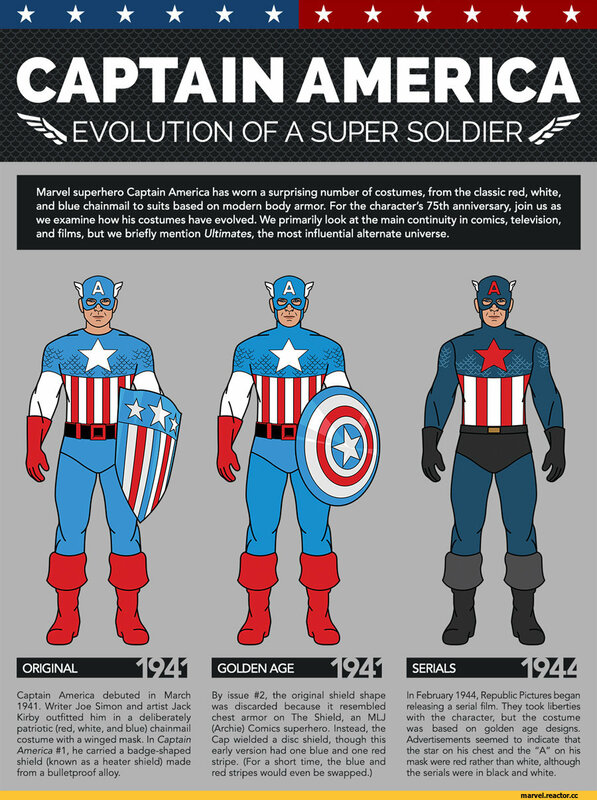 ﻿CAPTAIN AMERICA 4 EVOLUTION OF A SUPER SOLDIER Z' Marvel superhero Captain America has worn a surprising number of costumes, from the classic red, white, and blue chainmail to suits based on modern body armor. For the character's 75th anniversary, join us as we examine how his costumes have evolved. We primarily look at the main continuity in comics, television, and films, but we briefly mention Ultimates, the most influential alternate universe. Captain America debuted in March 1941. Writer Joe Simon and artist Jack Kirby outfitted him in a deliberately patriotic (red, white, and blue) chainmail costume with a winged mask. In Captain America #1, he carried a badge-shaped shield (known as a heater shield) made from a bulletproof alloy. 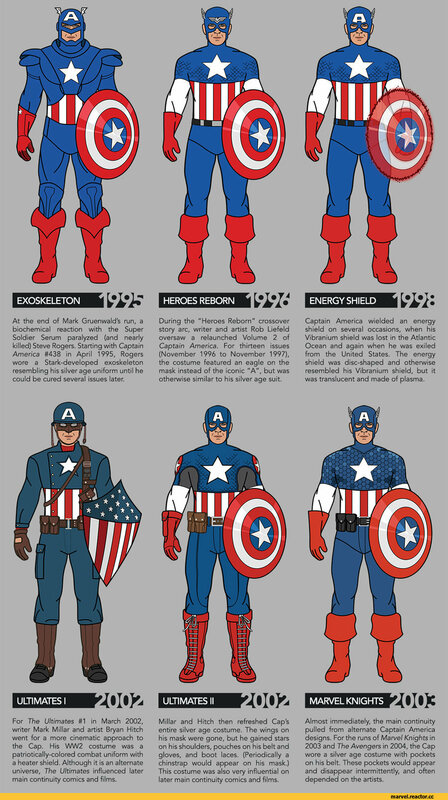 By issue #2, the original shield shape was discarded because it resembled chest armor on The Shield, an MU (Archie) Comics superhero. Instead, the Cap wielded a disc shield, though this early version had one blue and one red stripe. (For a short time, the blue and red stripes would even be swapped.) In February 1944, Republic Pictures began releasing a serial film. They took liberties with the character, but the costume was based on golden age designs. Advertisements seemed to indicate that the star on his chest and the "A" on his mask were red rather than white, although the serials were in black and white. ﻿Captain America was cancelled after February 1950 due to waning interest in superheroes, but editor Stan Lee and artist John Romita Sr. restarted the title in May 1954. A slight redesign included black briefs with a starred belt, a wide "A" on the mask, and a shield with the outer blue and white stripes gone. The Avengers freed Captain America from a block of ice in The Avengers #4, and the Cap soon joined the team. With Stan Lee and Jack Kirby at the helm, his black briefs were changed to blue boxers matching his blue pants, his "A" was back to normal, and he gained his iconic disc shield with two red stripes. In the midst of writer Steve Englehart and artist Sal Buscema's best-selling run of Captain America, Steve Rogers gave up being the Cap and instead became Nomad. His costume was blue and yellow, not patriotic at all. This lasted for only five issues, from #180 in December 1974 to #184 in April 1975. Two television movies, Captain America and Captain America II: Death Too Soon, aired on CBS in 1979. Played as a cross between Steve Rogers and Evel Knievel, his spandex costume was blue with red and white stripes implying a vest, plus starred boots and gloves. The costume was more faithful in the second film. Early in writer Mark Gruenwald's ten-year run, Steve Rogers suffered another crisis of faith. Starting in Captain America #337 (January 1988 on the cover, but published in late 1987) Rogers fought crime as The Captain. His costume and shield were black, red, and white, which were later adopted by U.S. Agent. A low-budget feature film was completed (and announced) in 1990, though it saw only a limited international release. Captain America was later issued as a direct-to-video title in 1992. 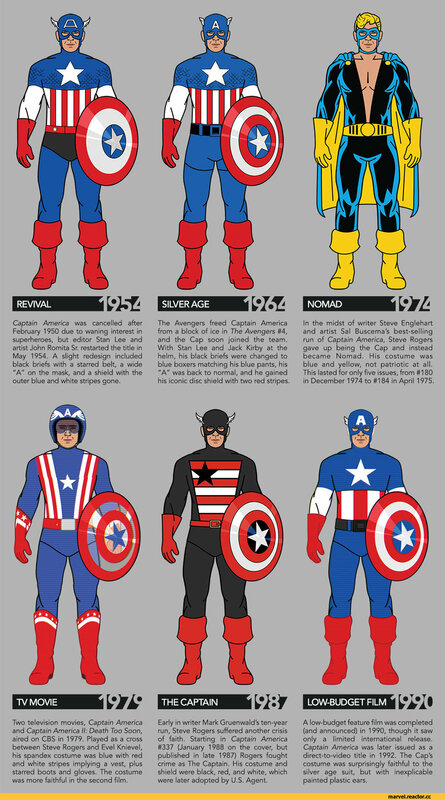 The Cap's costume was surprisingly faithful to the silver age suit, but with inexplicable painted plastic ears. ﻿At the end of Mark Gruenwald's run, a biochemical reaction with the Super Soldier Serum paralyzed (and nearly killed) Steve Rogers. Starting with Captain America #438 in April 1995, Rogers wore a Stark-developed exoskeleton resembling his silver age uniform until he could be cured several issues later. During the "Heroes Reborn" crossover story arc, writer and artist Rob Liefeld oversaw a relaunched Volume 2 of Captain America. For thirteen issues (November 1996 to November 1997), the costume featured an eagle on the mask instead of the iconic "A", but was otherwise similar to his silver age suit. Captain America wielded an energy shield on several occasions, when his Vibranium shield was lost in the Atlantic Ocean and again when he was exiled from the United States. The energy shield was disc-shaped and otherwise resembled his Vibranium shield, but it was translucent and made of plasma. ULTIMATES I ULTI MATES II MARVEL KNIGHTS ЭДОC For The Ultimates #1 in March 2002, writer Mark Millar and artist Bryan Hitch went for a more cinematic approach to the Cap. His WW2 costume was a patriotically-colored combat uniform with a heater shield. Although it is an alternate universe, The Ultimates influenced later main continuity comics and films. Millar and Hitch then refreshed Cap's entire silver age costume. The wings on his mask were gone, but he gained stars on his shoulders, pouches on his belt and gloves, and boot laces. (Periodically a chinstrap would appear on his mask.) This costume was also very influential on later main continuity comics and films. 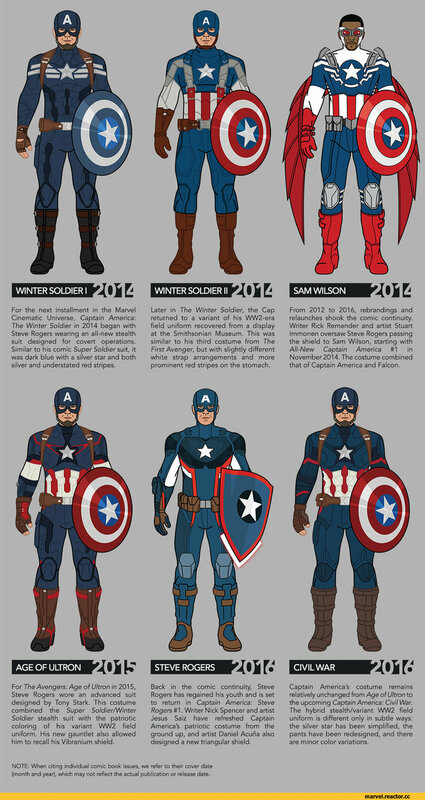 Almost immediately, the main continuity pulled from alternate Captain America designs. For the runs of Marvel Knights in 2003 and The Avengers in 2004, the Cap wore a silver age costume with pockets on his belt. These pockets would appear and disappear intermittently, and often depended on the artists. ﻿Виску Barnes, longtime friend of Steve Rogers, had a brief stint as Captain America himself. Only 25 issues into Volume 5, writer Ed Brubaker (seemingly) kills Rogers. By issue #34 in March 2008, Barnes had assumed the identity, wearing a half-patriotic, half-black costume but also wielding a gun and knife. 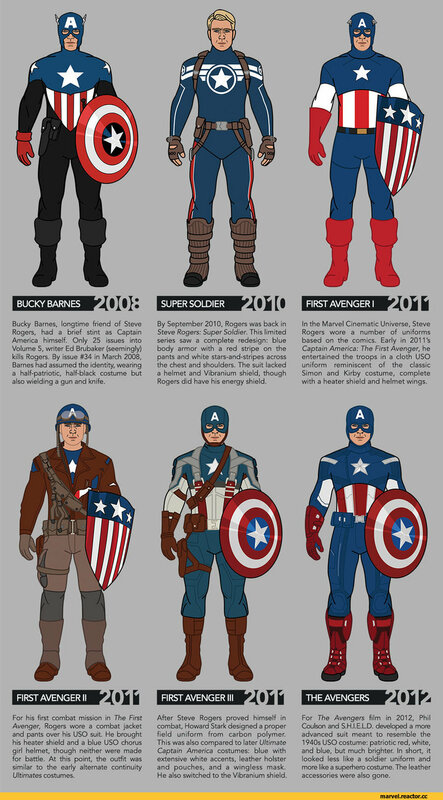 For his first combat mission in The First Avenger, Rogers wore a combat jacket and pants over his USO suit. He brought his heater shield and a blue USO chorus girl helmet, though neither were made for battle. At this point, the outfit was similar to the early alternate continuity Ultimates costumes. SUPER SOLDIER ФИ» By September 2010, Rogers was back in Steve Rogers: Super Soldier. This limited series saw a complete redesign: blue body armor with a red stripe on the pants and white stars-and-stripes across the chest and shoulders. The suit lacked a helmet and Vibranium shield, though Rogers did have his energy shield. FIRST AVENGER III After Steve Rogers proved himself in combat, Howard Stark designed a proper field uniform from carbon polymer. This was also compared to later Ultimate Captain America costumes: blue with extensive white accents, leather holster and pouches, and a wingless mask. He also switched to the Vibranium shield. In the Marvel Cinematic Universe, Steve Rogers wore a number of uniforms based on the comics. Early in 201 Vs Captain America: The First Avenger, he entertained the troops in a cloth USO uniform reminiscent of the classic Simon and Kirby costume, complete with a heater shield and helmet wings. For The Avengers film in 2012, Phil Coulson and S.H.I.E.LD. developed a more advanced suit meant to resemble the 1940s USO costume: patriotic red, white, and blue, but much brighter. In short, it looked less like a soldier uniform and more like a superhem costume. The leather accessories were also gone. ﻿For the next installment in the Marvel Cinematic Universe, Captain America: The Winter Soldier in 2014 began with Steve Rogers wearing an all-new stealth suit designed for covert operations. Similar to his comic Super Soldier suit, it was dark blue with a silver star and both silver and understated red stripes. For The Avengers: Age of Ultron in 2015, Steve Rogers wore an advanced suit designed by Tony Stark. This costume combined the Super Soldier/Winter Soldier stealth suit with the patriotic coloring of his variant WW2 field uniform. His new gauntlet also allowed him to recall his Vibranium shield. Later in The Winter Soldier, the Cap returned to a variant of his WW2-era field uniform recovered from a display at the Smithsonian Museum. This was similar to his third costume from The First Avenger, but with slightly different white strap arrangements and more prominent red stripes on the stomach. From 2012 to 2016, rebrandings and relaunches shook the comic continuity. Writer Rick Remender and artist Stuart Immonen oversaw Steve Rogers passing the shield to Sam Wilson, starting with All-New Captain America #1 in November 2014. The costume combined that of Captain America and Falcon. Back in the comic continuity, Steve Rogers has regained his youth and is set to return in Captain America: Steve Rogers #1. Writer Nick Spencer and artist Jesus Saiz have refreshed Captain America's patriotic costume from the ground up, and artist Daniel Acuna also designed a new triangular shield. Captain America's costume remains relatively unchanged from Age of Ultron to the upcoming Captain America: Civil War. The hybrid stealth/variant WW2 field uniform is different only in subtle ways: the silver star has been simplified, the pants have been redesigned, and there are minor color variations. NOTE: When citing individual comic book issues, we refer to their cover date (month and year), which may not reflect the actual publication or release date.